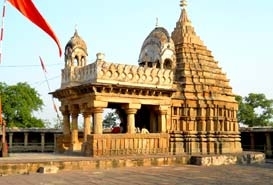 Vishvanath and Nandi Temple, Khajuraho has the five parts temple design similar to that of the Kandariya Mahadeva temple. The temple is dedicated to Lord Shiva and is one of the most beautiful temples in the city. 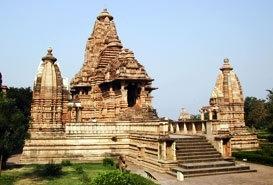 Apart from the Vishvanath and Nandi Temple, Madhya Pradesh, the other temples in Khajuraho are Chitragupta Temple, Chaturbhuj Temple, Lakshamana Temple, Parsavanatha Temple, Ghantai Temple, Adinatha Temple, Duladeo Temple, Chaunsat Yogini, Matangeshwara Temple and Kandariya Mahadeo. Vishvanath and Nandi Temple, Madhya Pradesh was built in 1002 A.D. Vishvanath and Nandi Temple, Khajuraho is a undoubtedly a masterpiece work and portrays the amount of hard work and skill that has gone into making it. Vishvanath and Nandi Temple, Khajuraho has a large image of Shiva's vehicle, the bull (Nandi), that faces the temple from the other end of the common platform. There are steps that lead up to this high terrace of the temple and is flanked by lions on the northern side and elephants on the southern side. 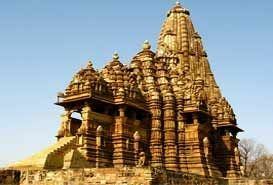 The sculptures around the Vishvanath and Nandi Temple in Khajuraho in India include the usual Khajuraho scenes, but the notable feature here is the sculpture of women. These women are seen to caress a baby, write letters, play music and are depicted in sensual moods.